If I were to tell you GM is the new BMW you'd probably laugh at me. But driving the 2009 Pontiac G8 GXP just a couple of months after the 2009 Cadillac CTS-V and Corvette ZR1, that's exactly what I'm thinking. 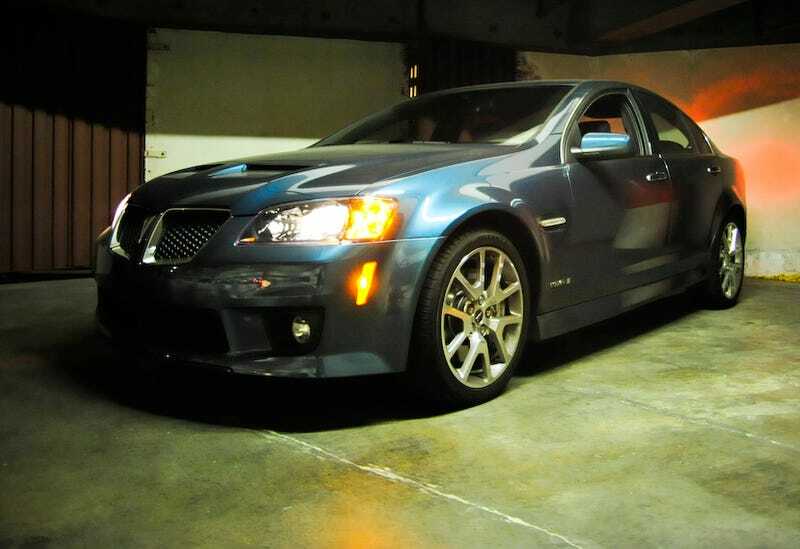 Equipped with a 6.3-liter, LS3 V8 making 415 HP and 415 lb-ft of torque, the G8 GXP isn't just the fastest car Pontiac's ever made, but based on GM's new global rear wheel drive platform (the same one as the new Camaro) and fitted with lower, stiffer suspension and a six-speed manual gearbox it strikes the right balance between supercar performance and real world practicality. Think E39 M5, but with a Corvette engine and better steering. Driving in LA is a strange mix of sitting still in hellish traffic and driving flat out on the best roads in the world. Get on one of the highways at the wrong time and it'll take you three hours to go 30 miles, but hit the canyon roads to the North or East and it's easy to forget that you're within mere miles of the most populous metropolitan area in the country. The G8 GXP excels in both environments. In the city it's easy to drive and comfortable, belying the potential of its performance. LA's rutted concrete highways and constant construction fail to upset the suspension or disturb the peace of the quiet interior. Keep it below 3,000 RPM and, with the aid of its anonymous styling, you'll probably avoid speeding tickets too. But after four days spent trying to keep my temper in check in traffic it was time to head for the hills. More specifically Deer Creek Road in Malibu. Mostly first and second gear hairpins with no guardrails and 500-foot drops into rocky gorges, it's not the kind of place you'd typically want to drive a traditional GM product. But it is the kind of place you'll want to drive this GXP. This isn't just some overpowered muscle car, the GXP can seriously handle. Throw it into a sharp corner and it'll hold its line tightly without even a hint of understeer; pushing the tail wide on exit with the immense torque before rocketing down the short straights. Nothing in here feels wallowy; instead the overall impression is of lithe performance. That's thanks to lower, stiffer FE3 suspension over the 2008 Pontiac GT's FE2 setup. GM tuned the handling, as is the fashion these days, on the Nurburgring, where the engineering team set an unofficial fastest time of 8 minutes and 30 seconds. That's a similar suspension setup to the CTS-V, with which the GXP also shares its Brembo front brake calipers and Tremec 6060 6-speed. Of course, the GXP isn't all perfect. It doesn't have SatNav (based on an Aussie-market Holden, the screen violates some pointless US angle regulation and the G8 is too small a production run to reengineer the interior) and the interior isn't up to the standard of contemporary European or Japanese competitors. But with an estimated MSRP of $37,000 (excluding gas guzzler tax and destination, figure $40k to drive it off a lot) we're prepared to forgive those foibles and instead concentrate on the performance: 0-60 comes in 4.7 seconds and it'll run the quarter in 13.0 seconds at 108mph. All while carrying five people and plenty of their luggage in comfort. Fuel mileage is estimated to be 14 MPG city, 20 highway. So where does BMW come into this? There was a time when - before exclusively focusing on overweight, overcomplicated, boring-to-drive, ugly cars - that it produced vehicles that rightfully deserved the "Ultimate Driving Machine" title. They were simple, well-engineered and put driving first. They had solid, well-built black plastic interiors, manual transmissions and pretty big engines driving only the rear wheels. They don't any more. They used to combine practicality with fun in just the right proportions. They don't any more. This Pontiac does. So do the Cadillac CTS, the CTS-V, the G8 GT, the Corvette and the best car in the world, the ZR1. But, unlike even the old BMW, all of the above are, for their classes, very affordable. GM isn't just the new BMW; it's better than that. This review has to come with a slight disclaimer. The G8 GXP is scheduled to go on-sale in February. At this point, we don't know for certain if GM will still be in business then. I'm not of the opinion that GM and its counterparts are the wisest place to invest our tax money, nor do I entirely believe their apocalyptic forecasts of job losses and economic collapse should we allow them to go out of business. I'm wearing my Save GM T-Shirt for one reason and one reason only: If they're going to keep making cars like this, I really want to keep driving them.